Because you know you're asking how to do it already. No doubt you're still on the Pokemon Go grind, like the rest of America and the world. But what do you do when you run out of Poke Balls or other items and have no Pokecoins to spend? You're out of luck unless you follow these tips. Don't let the game fool you into thinking it's 100% free to play unless you live right by a Poke Stop that you're going to want to refresh every five minutes. You can get more coins, but you're going to have to follow this guide to do so. The best part? You're not going to be out any money, as it should be. We already published a guide on Pokemon Go gyms and what it means to take control of them, as well as what they mean and what they can do for you in-game. If you're not familiar with those, check out the Gyms guide and make sure you're up to date so you know what you're doing before seeking out more currency. The first step to getting Pokecoins is to take over a gym that's occupied by an opposing team. This means you'll have to battle your way to the top, but that's to be expected if you're going to be a Pokemon Master one day. The higher the gym's prestige level, the more Pokemon Trainers you'll have to defeat. Once you've gotten a gym, hold it as long as possible by assigning your strongest Pokemon there to take it. Leave a Pokemon there and set out to visit as many gyms as possible to claim them for your team, because you're going to need to if you want to stock up Pokecoins. Hold the gym and get with friends. If you want to see the coinage start rolling in, make sure you hold the gym. Each gym you have a single Pokemon dropped off at to protect the stronghold will be getting a defender bonus, which is 10 Pokecoins that are distributed about every 24 hours. You can have up to 10 gyms under your control at a time, and if you manage to rack up that many (it's easy to do if you live in a heavily-populated city) and that means you can get 100 Pokecoins every day. Save those up and you'll be able to purchase basically anything you need quicker than you would have before, you know...without spending money. But you'll need to coordinate with friends if you want to get these coins coming in. Make sure you and your squad can hold it down, because nothing makes someone want to control a gym more than seeing an enemy is holding it, especially if it means you can bypass spending real money on getting Pokecoins. Purchase them if you can't get by otherwise. You can always, as a last resort, purchase coins if you need them, but think about why you might. 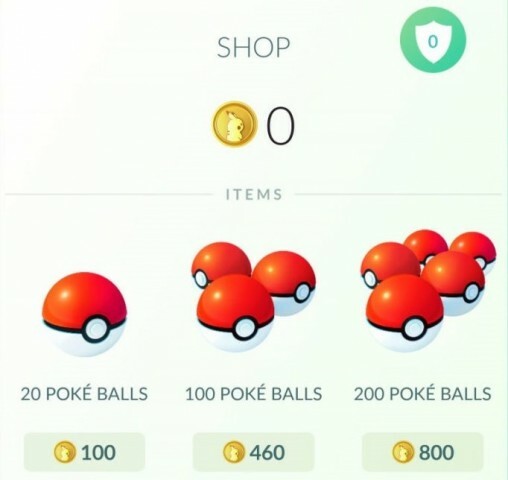 If you can walk within range of a Poke Stop and just need Poke Balls, there's no real reason to part with cash, as that's the only extremely dire item you'd actually need to purchase. But if you don't want to get into the competitive aspect of the game and want items fast, you can still buy them. Don't worry!